1: The Hunterian, University of Glasgow: John Honeyman & Keppie / Honeyman, Keppie & Mackintosh / Keppie Henderson cash book, 1889–1917, GLAHA 53079, p. 10. 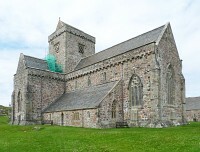 2: The drawings are referred to in a later minute of the Iona Cathedral Trustees (Edinburgh, Royal Commission on the Ancient and Historical Monuments of Scotland: Iona Cathedral Trustees Archives, accession 2007/266, Trustees' Minute Book 1899–1922, 10 January 1900). A set of drawings dated 1891 survives (Edinburgh, Royal Commission on the Ancient and Historical Monuments of Scotland: AGD/23/630–635); these are included in the Drawings tab of this project entry . 3: The Hunterian, University of Glasgow: John Honeyman & Keppie / Honeyman, Keppie & Mackintosh / Keppie Henderson cash book, 1889–1917, GLAHA 53079, p. 11. 4: The Hunterian, University of Glasgow: John Honeyman & Keppie job book, GLAHA 53059, p. 147. 5: Scotsman, 30 September 1899, p. 10. 6: Edinburgh, Royal Commission on the Ancient and Historical Monuments of Scotland: Iona Cathedral Trustees Archives, accession 2007/266, Trustees' Minute Book 1899–1922, pp. 53–5, Memorandum for the Trustees of Iona Ruins, 21 February 1903. 7: Edinburgh, Royal Commission on the Ancient and Historical Monuments of Scotland: Iona Cathedral Trustees Archives, accession 2007/266, Trustees' Minute Book 1899–1922, pp. 53–5, Memorandum for the Trustees of Iona Ruins, 21 February 1903. 8: Edinburgh, Royal Commission on the Ancient and Historical Monuments of Scotland: Iona Cathedral Trustees Archives, accession 2007/266, Trustees' Minute Book 1899–1922, 6 October 1903. A detailed description and costing of Honeyman's proposals, in the form of a report by MacGibbon & Ross dated 5 October 1903, is included the minutes of the Trustees' meeting on 12 July 1904. 9: Edinburgh, Royal Commission on the Ancient and Historical Monuments of Scotland: Iona Cathedral Trustees Archives, accession 2007/266, Trustees' Minute Book 1899–1922, 23 February 1904. 10: Edinburgh, Royal Commission on the Ancient and Historical Monuments of Scotland: Iona Cathedral Trustees Archives, accession 2007/266, Trustees' Minute Book 1899–1922, p. 93, 'Report by Dr Honeyman, 2 March 1905, to the Iona Trustees, on the work done under his direction during the year to 31 December 1904'. 11: Edinburgh, Royal Commission on the Ancient and Historical Monuments of Scotland: Iona Cathedral Trustees Archives, accession 2007/266, Trustees' Minute Book 1899–1922, p. 105, copy of letter from John Honeyman to trustees, 5 May 1905. 12: Edinburgh, Royal Commission on the Ancient and Historical Monuments of Scotland: Iona Cathedral Trustees Archives, accession 2007/266, Trustees' Minute Book 1899–1922, p. 152. 13: The Hunterian, University of Glasgow: John Honeyman & Keppie/Honeyman, Keppie & Mackintosh / Keppie Henderson cash book, GLAHA 53079, p. 94. 14: Scotsman, 20 November 1905, p. 9. 15: The Hunterian, University of Glasgow: John Honeyman & Keppie / Honeyman, Keppie & Mackintosh /Keppie Henderson cash book, GLAHA 53079, p. 107. 16: Edinburgh, Royal Commission on the Ancient and Historical Monuments of Scotland: Iona Cathedral Trustees Archives, accession 2007/266, Trustees' Minute Book 1899–1922, 7 March 1907. 17: Edinburgh, Royal Commission on the Ancient and Historical Monuments of Scotland: Iona Cathedral Trustees Archives, accession 2007/266, Trustees' Minute Book 1899–1922, 5 July 1907. 18: Edinburgh, Royal Commission on the Ancient and Historical Monuments of Scotland: Iona Cathedral Trustees Archives, accession 2007/266, Trustees' Minute Book 1899–1922, 22 October 1907. 19: The Hunterian, University of Glasgow: John Honeyman & Keppie / Honeyman, Keppie & Mackintosh /Keppie Henderson cash book, GLAHA 53079, p. 112.